When you visit Wimberger’s, you’re in for a culinary and a shopping experience! 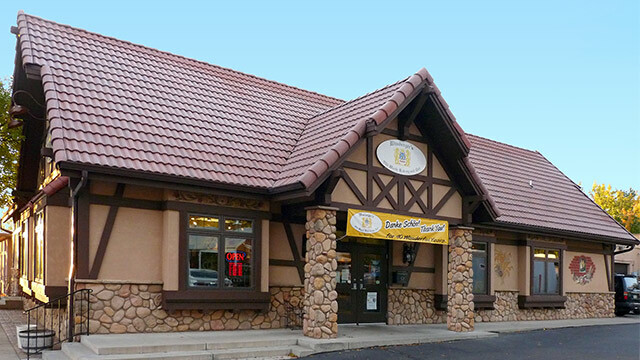 We’re now in our 43rd year of providing the finest in German baked goods, delicatessen and imported grocery items to Colorado Springs and El Paso County! Above all, Wimberger’s is a bakery … an “old world” bakery. In Germany, bread is a much more important part of day-to-day cuisine. Robert Wimberger, who founded the business with his wife, Gisela, was originally a baker in Germany. They brought their skills, family recipes and attention to the smallest details together to create baked goods rarely found on this side of the Atlantic. Their son Randy and daughter-in-law Ulrike are keeping up the tradition. Here baking is truly an art form! You’ll find absolutely no similarity to our breads and pastries and the products you find on the shelves of supermarkets and convenience stores. Our specialties include Rye bread, Kaiser rolls, soft pretzels, poppy seed rolls and more. To cater to your “sweet tooth”, we offer streusel, fruit tarts, Berliners (German donuts), Nutella croissants, cinnamon rolls and many other unique goodies. Everything is prepared completely from “scratch”. We use only the finest natural ingredients with no preservatives and bake fresh every business day. Your Wimberger’s breads and baked goods are never more than a few hours out of the oven! You’ll also want to visit our Delicatessen. In our “deli”, you’ll find imported cheeses, meats and sausages unlike anything offered locally. We invite you to expand your epicurean horizons … come in and sample our Fleischsalat, herring salad, potato salad, sauerkraut, Wurstsalat, Gurkensalat, liver pâtè and our special Christmas bread – “Stollen”. Havarti, different Gouda cave aged cheeses, cheese spreads and Brie, just to name a few; plus Hengstenberg products, vinegar, salads and mustards; assortments of Kinder Schokolade, Danbo and Hero jams and jellies, Jacob’s coffee, an assortment of teas, Maggie’s Knorr Fixes, soups, seasonings and salad dressings; all difficult to find in this country. Indulge yourself, your family and your guests with a truly different dining experience! Wimberger’s delivers to commercial accounts locally and ships anywhere in the U.S. by UPS or USPS. Call us at 719.634.6313 for more information. 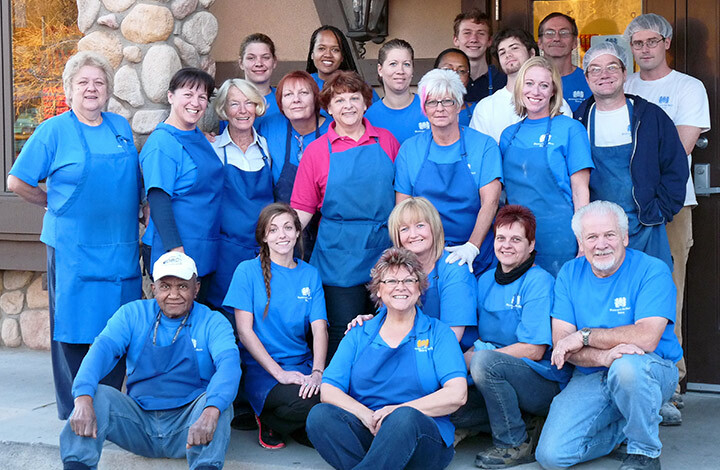 Wimberger’s staff looks forward to serving you! The service and hospitality at Wimberger's is always first rate. I have been coming here for 34 years. The bread and rolls are the best in town. A touch of home and I get what I want. The service is fantastic. Best bread in town. The people who work here remind me so much of friends I have in Germany. The breads, rolls and meats are true to good German tradition. I'm coming to Wimberger's because of the comfortable, friendly atmosphere from home and I get all of my food items that I am accustomed to from Germany. The variety of items, cold cuts, the fresh brotchen. I love it! Authentic deli meats and cheeses which are fresher and better flavored than supermarket deli selections. We have to bring cheese, salami and rolls to our college kids in Boulder and Santa Fe when we visit. We like coming here because of the variety of European food and the excellent quality. Having been raised (for 6 years) in Germany as a child and young teenager, I grew accustomed to going to the bakery for freshly baked brotchen in the morning. I was delighted to find an authentic German bakery when I moved to Colorado Springs. I love this place, that's why! Wimberger's sticky croissants are the celebratory breakfast for two of our three kids. Our Denver relatives always want us to bring pretzels and Westphalia ham to family events. When I found you 16 years ago, I was elated to find my German bread and rolls. I love to come here at Christmas time. Every Christmas breakfast is cheese and bread from Wimberger's. We wouldn't miss Wimberger's on Christmas Eve, it's a neighborhood celebration. © Copyright 2016: Wimberger's Old World Bakery & Delicatessen. All rights reserved. Website design by COMPU10. Choose the best cheap jerseys is right for you. Great & perfect cheap jerseys is comfy & stylish at the same time.